Get the big picture on converged network architectures and emerging protocols! Converged networks integrate voice, video, and data traffic on a single network. This book covers converged network architectures as well as the latest enabling protocols including SIP, H.323, MPLS, and H.248. 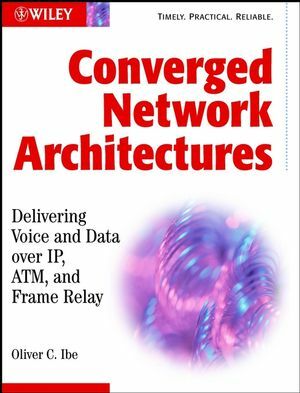 Readers will gain a better understanding of network architectures and protocols such as SONET, frame relay, ATM and IP. The book offers the latest information on voice communication networks, data networks, voice packet processing, coding for broadband systems, and voice- over packet networks. Readers will also discover how converged networks can provide the highest level of service for the least cost. OLIVER C. IBE, ScD, is Director of Network Architecture at Spike Broadband Systems, a fixed broadband wireless company. He has been a research staff member at IBM's T. J. Watson Research Center, Digital Equipment Corporation, and GTE Labs; a network architect at Cabletron Systems and Xyplex Networks; and director of network architecture at Adaptive Broadband Corporation. Dr. Ibe has taught at Georgia Tech and was a visiting scientist at MIT. He was the managing editor of Computer Networks and ISDN Systems and is a senior member of IEEE. 1. Overview of Converged Networking. 2. Voice Communication Network Concepts. The Public Switched Telephone Network. Call Control and Signaling System Number 7. Increasing Voice Channel Bandwidth Utilization. 5. Modulation Schemes for Wireless and Broadband Systems. Impairments Associated with Wireless Communication. Impairments Associated with Wireline Broadband Systems. The H.323 Recommendation and Voice-over-Packet Networks. Quality of Service Issues in Voice-over-Packet Networks. The PINT Service Protocol (RFC 2848). Comparison of Voice over ALL Schemes. 9. Voice-over Frame Relay Networks. Frame Relay Forum VoFR Model. Review of the Voice-over-Packet Models. 10. Converged Networks Access Technologies. 11. The Softswitch Model of VoIP.